When does poetry begin to capitulate? turn back in on itself? When it fails to assimilate the new, the foreign, when in the words of Nietzsche in The Birth of Tragedy, the human remains in a perpetual state of individuation; or what in this country, England, has always been its burden, the totality of the influence of one poet: T.S. Eliot. The Russian futurist poet Vladimir Mayakovsky playfully opened the door on “influence” in 1917 by saying: “we mustn’t squabble with the poetry of the past – it provides us with a textbook to study.” All too true, but to the detriment of British poetry today Eliot’s “textbook” is still read with the same kind of reverence usually reserved for the Old Testament; and so what of those who still believe in Eliot’s work today? Well, the critic, with an hourglass in one hand, and a metronome in the other, bears down on those poets of too weak an imagination to free themselves from the destructiveness of his influence, which is amplified by each reviewer’s need for self-replication, transparency, or worse, literary objectivism. 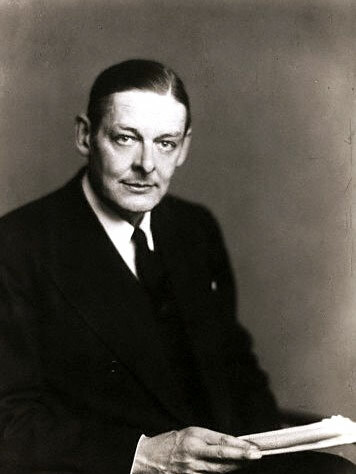 So surely the question must be, after Eliot, can poetry? Yes, if it does what it has so far never done, and pull away from the crippling hold on its imagination by those principal culprits of poetical atrophy in this country, Eliot, Auden and Larkin; three poets who have left English poetry with an infertile and barren womb, and a poetry that has no great or imperative subject matter, but which through a series of fractious vignettes of domesticity, love, and personal history, strives in vain for one. It sounds obvious, yet British poetry has always failed, either willingly or unwillingly, to acknowledge this sane poetic truth. But what a different outlook, approach, and reality our poetry might have had today if, notwithstanding the always trite and facile English arguments concerning translation, our main poetic influences in this country were all of a European or world variety? If say instead of The Waste Land, we had fully absorbed The Twelve by Aleksandr Blok or (the poem that kick-started the 20th century for me) A Cloud in Trousers by Mayakovsky, or instead of say W.H. Auden we had turned to the poetry of Austrian poet Georg Trakl for our reports from a declining world empire, and then (and even more impossible to believe) in times of conflict and war we turned not to the poetry of Siegfried Sassoon or Wilfred Owen, but to the poetry of say August Stramm, Apollinaire or the strong chiliastic visions of the German Expressionist poet Georg Heym? A deliberately provocative fantasy it’s true, but I am daring to imagine an alternative poetic terrain for these shores; and while it is also true that “influence” of any kind, at best, can become a hindrance, at worst, as in the case of Eliot, a cataclysmic unfolding of an inner irrational cancer. This is why thirty years after Larkin, poets in this country still feel drawn to the safety of an English librarian in a raincoat, in bicycle-clips, and of a sensibility so doom-ridden it’s a surprise that he ever managed to get out of bed in the morning, let alone write those insufferably beautiful poems of the Everyman. I am of course being deliberately provocative, simplifying, laying bare what can’t be, but so what? A correct approach of course when writing this would be to evaluate all “styles” and modish concerns, yet innovation is still the undreamed-of truth in British poetry; hence we are forced to endure long and verbose two-part essays on the importance of the lyric (Don Paterson, Poetry Review), another “old” revolution that began as a whisper, and still, today, is passed on, from ear to ear, by those either too old, or too used to repetition to clamber up onto the scaffold of any one new construct of language. I say that the “forms” of the future will become no more than irregular scaffolds, sturdy enough only to withstand the poet’s bodyweight above the rising sea-levels. The poet of the 21st century will, like any animal, be subject only to the continuing process of adapting to his own biological environment, a poetry that must strive in its imagination to actually affect the planetary balance. So what of our own poets today? Well, after the work of the “New Generation” had inevitably fragmented, re-isolated itself, drew back to its (always) disparate earlier parts, we find ourselves, amid the cheerful hubbub of literary tittle-tattle, back in the classroom, the creative workshop. The majority of the fin-de-sièclepoets here in Britain, and those so far of the new millennium have dealt, ostensibly, in “minor things,” its authors contaminated with the need to sound universal, but with the obsession always of trying to condense their metaphysical condition, or attitude, or both, into the necessary British mould. “Nothing so pure can co-exist with the circumstances of life. I have talked at length on this subject, in all manner of literary discussions, to myself, and to anyone who’ll listen, in conversations with poets, editors, in reprisals against both critic and poet alike, in which I have felt the incessant need, if not to dismantle, or smash apart, then at least to dislodge this Eliot-like millstone around our necks, to entertain the occasional and inappropriate fiction of a poetical terrain without Eliot, and to allow this transition from the old to the new to be renovated by a new world insight, perspicacity, but never by using the lingua franca of the intellect, only the soul. And so today, as English poetry moves on effortlessly into the vacuum of its own concerns, and its energies dissipate and interchange, we can only hope for some kind of a turnaround; for I say English poetry must stop recoiling from the horrors and quite inscrutable realities of the world, and instead of self-dramatizing itself by creating an always domestic enclave, in which the religious, cosmological and eschatological are squeezed out, it must learn to embrace something other than the infliction of the banality of the everyday and the personal. The “I” in English poetry today that seems no more than a dusty old hat-stand on which to hang the masks of the faces of the poets too long dead. Let us abandon the workshop, the poetry schools, the egotistical concretion of the poetical “facilitators,” the editors of our most important periodicals whose own “likes” and “dislikes” hold too tyrannical a bearing on a reader’s ability in this country to make up their own minds on who or what they should be reading. Let them separate the good from the bad for themselves. The great innovative poetry of the 21st century will be forced to assimilate new religions, genetics, nanotechnologies, robotics – I hope, for its own survival, that British poetry can learn to un-rope itself from its own (always) island-bound verbiage, to become for the first time, what it has never been, in any era, a truly World poetry; for our poets to become (how Ted Hughes described Eastern European poets to be) “the most wide-awake of poets”. And then, only then, might English poetry learn to become unfamiliar again with itself. “To either dissolve self-consciousness, and lose oneself forever in animal innocence or liberate oneself from history” – Octavio Paz noted this after a lifetime’s search for the poetical self. Let us hope that the British poet, susceptible finally to the ills and ultimate catastrophes of the world, learns himself to develop such a poetical affront. First published in 3:AM Magazine: August 4th, 2009. Republished with minor amendments in The Fiend, December 2010.